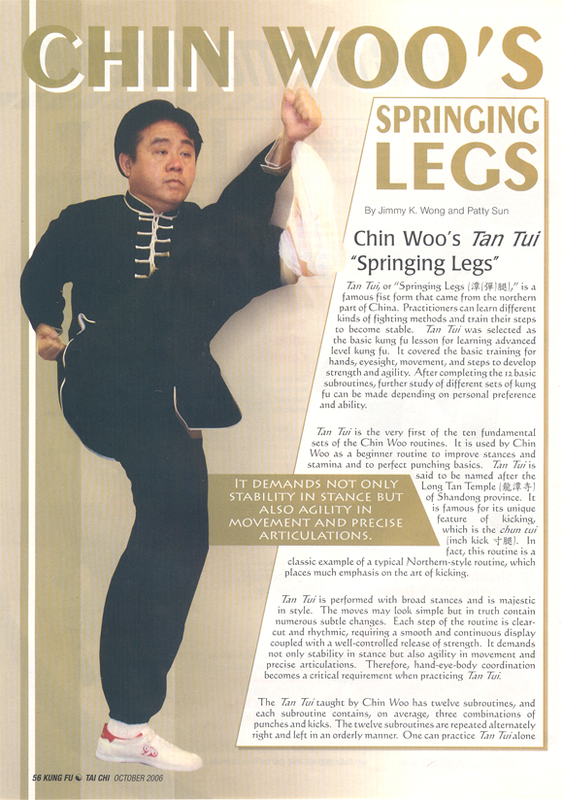 Tan Tui, or “Springing Legs”, is a famous fist form that came from the northern part of China. Practitioners can learn different kinds of fighting methods and train their steps to become stable. 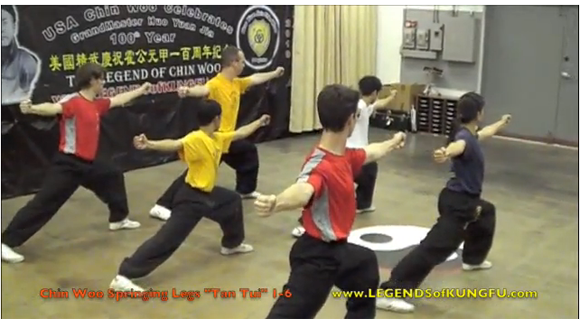 Tan Tui was selected as the basic kung fu lession for learning advanced level kung fu. It covered the basic training for hands, eyesight, movement, and steps to develop strength and agility. After completing the 12 basic subroutines, further study of different sets of kung fu can be made depending on personal preference and ability. Tan Tui is the very first of the ten fundamental sets of the Chin Woo routines. It is used by Chin woo as a beginner routine to improve stances and stamina and to perfect punching basics. Tan Tui is said to be named after the Long Tan Temple of Shandong province. It is famour for its unique feature of kicking, which is the chun tui (inch kick). In fact, this routine is a classic example of a typical Northern-style noutine, which places much emphasis on the art of kicking. Tan Tui is performed with broad stances and is majestic in style. The moves may look simple but in truth contain numerous subtle changes. Each step of the routine is clear-cut and rhythmic, requiring a smooth and continuous display coupled with a well-controlled release of strength. It demands not only stability in stance but also agility in movement and precise articulations. Therefore, hand-eye-body coordination becomes a critical requirement when practicing Tan Tui. The Tan Tui taught by Chin Woo has twelve subroutines, and each subroutine contains, on average, three combinations of punches and kicks. The twelve subroutines are repeated alternately right and left in an orderly manner. One can practice Tan Tui alone or by sparring with a partner. The sparring routine is known as Jie Tan Tui (Springing Legs Applications) and is particularly good for exercising agility, sharpening the senses, improving combat skills and increasing comprehension of the practical use of each step. Check back next week for our next for Part II of our Tan Tui series. No Comments to "Why We Practice Tan Tui"